We work with organizations like yours every day and hear how teams are innovating new approaches to these challenges. 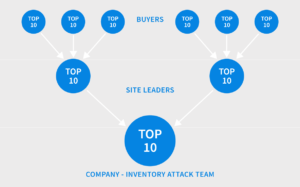 When it comes to driving coordinated action toward inventory optimization goals, one of the best tactics we’ve heard recently is the deployment of an Inventory Attack Team using advanced analytics, your buyers, and the leaders of your site procurement teams to empower the right people to focus on the most impactful actions each day. Let’s take a closer look at how you can implement this strategy in your supply chain organization. The goal of an Inventory Attack Team is to hold everyone accountable and ensure each site has a similar amount of actions to complete. Start simple by focusing on 10 key actions per day (or week) per site, depending on how large your organization is. This typically translates into just a handful of actions per buyer at each site. The key is to make it easy for your team to identify the top actions. You don’t need to boil the ocean. It’s not necessary to solve everything at once. Next we’ll explain what this looks like in practice. Select a representative from each site in your organization, ideally your supply chain or procurement leaders responsible for the purchasing teams at the sites. Corporate Supply Chain Leader: The leader of the global supply chain team responsible for procurement, inventory, and other key supply chain functions. Senior Supply Chain Analyst (Inventory Action Team Lead): A senior staff member on the corporate supply chain leader’s team. Typically this person has a deep understanding of the business and data systems, and helps the sites achieve their goals. For the purposes of the Inventory Attack Team, this person helps orchestrate meetings and organizes reporting as described below. Site Supply Chain Leaders: The local site supply chain leadership responsible for procurement and inventory management at a single site. Companies that are succeeding with this approach create a process to methodically triage their top inventory management tasks every day and hold each person accountable for their part in actioning them. Establish a repeating meeting or phone call to review top inventory management actions based on value. One way we’ve seen work is for the corporate supply chain leader to create a weekly kickoff with the site representatives. On this call, you’ll review the top 10 actions across the entire organization. All site leaders should be prepared to speak about each of the actions they own from the list, which means they should have their buying team working on each of their top 10 actions every day. Throughout the week, designate an Inventory Attack Team Lead to periodically update the team on progress toward resolving the actions. Typically, this would be a senior supply chain analyst on the corporate supply chain team responsible for all sites. Since each site may explain issues slightly differently, it’s helpful to establish common terminology so problems shared across sites can be discussed the same way. LeanDNA or a similar uniform, web-based tool can provide the framework for establishing this terminology. At the end of the week, the team lead reviews the top actions and notifies the attack team if any top actions are not complete. Hold everyone accountable for their top 10 actions. Who owns the action? What’s the next step? What’s the status? Try to close everything out within the week. This way, you can move on to the next 10 the following week. If something can’t be closed out in a given week, use due dates to capture when the expected resolution will take place. This will give you a realistic understanding of how long the issue should remain open and prevent you from spending unnecessary time discussing it in the meantime. If you have many different sites of varying sizes that are building different types of products (e.g., low volume vs. high volume or make-to-order vs. make-to-stock), you can group them so that each site will have a few actions in the top 10 list across their grouping. Gradually increase the volume of actions over time and see rapid results. You want to strike a balance between quantity and value of actions. This will depend on the value and number of SKUs you purchase, the size of your purchasing teams, and the speed of resolving actions. If you can get through 10 per day, that’s more than 200 per month and should quickly lead to meaningful results. Escalating issues up the ladder or to an adjacent department can be key in keeping progress moving forward. The buyers or site supply chain leaders on the call might not be the ones who will take a required action, but that doesn’t mean the action can’t be taken. Establishing an Inventory Attack Team can help any large company operationalize an inventory reduction initiative. Gathering the key players—site supply chain leaders, senior supply chain analysts, and the corporate supply chain leader—and building a process to prioritize actions while holding everyone accountable will result in quick inventory management wins.